Ski the mild climate in Northern California and extend your waterski season into early spring and late fall. 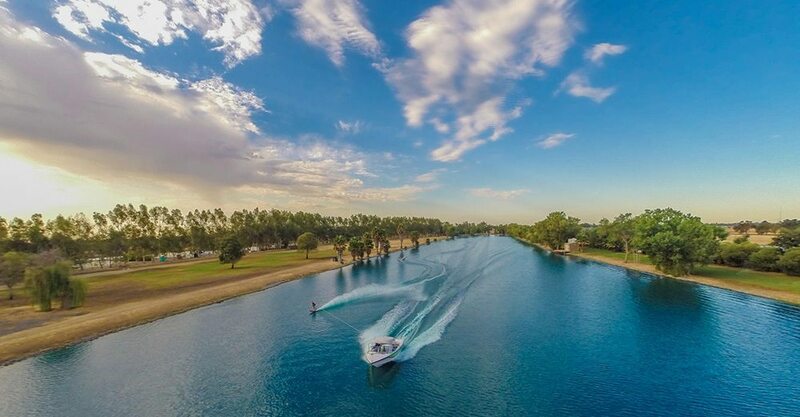 The layout of our lake lends itself to perfect conditions most months of the year. When Canada and other northern state are blanked in snow, the northern central valley of California has much milder weather well beyond the peak of summer. Practice and learn to ski without distraction. Waterskiers on a short line at high speeds will immediately recognize and appreciate the exceptional conditions of the water at Bell Acqua Lake One. The Pro Slalom and Jump skiers that train at our facility always comment on the quality of the water. The north-south orientation of the lake, combined with the special water conditions, allows skiers to perform to their highest standards. Our lake is lined with fully mature trees that provide wind protection and shade, giving our facility some of the most stable water conditions even when the wind picks up. Contact us for our off-season rates.